While it existed, Florida State’s 29-game victory streak was a marvel of talent, player development, and sweet fortune, and comprised two neatly composed halves: one of annihilations and one of swashbuckling escapes. That streak’s 59-20 ruination, dealt by the Oregon Ducks in Thursday’s playoff semifinal, was no less spectacular, though considerably more abrupt. It lent a finality to a Rose Bowl game that was reduced to serving as a palatial pit stop en route to the first playoff-produced national championship game at college football’s highest level. The Seminoles’ dazing chain of wins is not undone, but it is over, mown under and buried deep in Pasadena in a sort of slowly unfolding slasher film, the kind where the hero keeps just out of reach of the blades for a while before pratfalling repeatedly into a series of ankle-deep holes, all set against the serene backdrop of the San Gabriels. The killer in pursuit, moving with supernatural speed, has lifeless, pool-black eyes, a pert sailor hat, and no pants. “It was never over,” said FSU quarterback Jameis Winston after the game, and HI HELLO SCOREBOARD retorts aside, think about it: This is his truth. It never has been over for him, not in his entire collegiate career. Not as a redshirt freshman, when he was surrounded by umpteen unbreakable, unbeatable weapons of such size and strength, and not this season as a sophomore, when he played alongside an arsenal peppered with inexperienced and injured components and was repeatedly forced to drag the sled. “This game could’ve gone either way,” he said, and this, too, has some truthiness to it, given how many times we’ve seen him stare up out of a well and hoist his team from those depths with his throwing arm. These comments bear the brashness of a young quarterback, but they’re grounded in earthbound logic, even when they really, really shouldn’t have been. The first time we saw Winston’s offense staring up out of that well was in this very stadium, almost a year ago. But Thursday’s second-half view for FSU was more of an abyss, and one that had to do with more than the scoreboard. Injuries here and execution errors there can be overcome. Both at once, coupled with malevolent eddies of fortune all going the wrong way at the same time, take on the form of a performance that Thursday night produced: a negative image of the Seminoles’ star-favored, storied title run. As if to make up for that interminable stretch of 2014 in which Florida State never once lived down to its numbers, probability reasserted itself in the Rose Bowl, and then took things entirely too far to be believed. That’s not to disparage the Ducks’ performance — a showstopper of a semifinal that was fought on two fronts, one against Florida State and one against Oregon’s own spiraling injury list — but you had to see the carnage with your own eyes, on a screen or in the stadium, to believe the tide of misfortune that swamped the Seminoles in the span of one 15-minute segment of football. Neither Heisman-toting quarterback played his best ball, but Oregon responded to the early loss of receiver and return man Devon Allen with a bravura big-play barrage by Darren Carrington, a star turn by little-used tight end Evan Baylis, and a 13-carry, 124-yard, two-touchdown outing from sophomore back Thomas Tyner.1 Florida State’s excellent tight end Nick O’Leary played through a hamstring injury sustained in warmups; Winston’s other receivers did him few favors in the drops department, and the Noles’ best weapon, freshman tailback Dalvin Cook, committed the first two FSU fumbles recovered by Oregon to open that fateful third quarter. Coach Jimbo Fisher later called the third period of this Rose Bowl “one of the worst quarters we’ve had,” which somehow carried the aura of a titanic understatement. Here’s Winston again, postgame: “I never thought I would slip and throw the ball backwards.” Again, no arguing; this seems the only possible reaction given the situation. For all the HOW? !s we’ve hurled in incredulity in Florida State’s general direction over the past two years, it stands to reason that lurking somewhere in the universe, there must be HOW? !s of equal and opposite power. We just never expected to see those counter-events manifest all at once and form another geological layer of unreality atop a Rose Bowl that is still a be-all destination, but no longer the end-all of a team’s season. 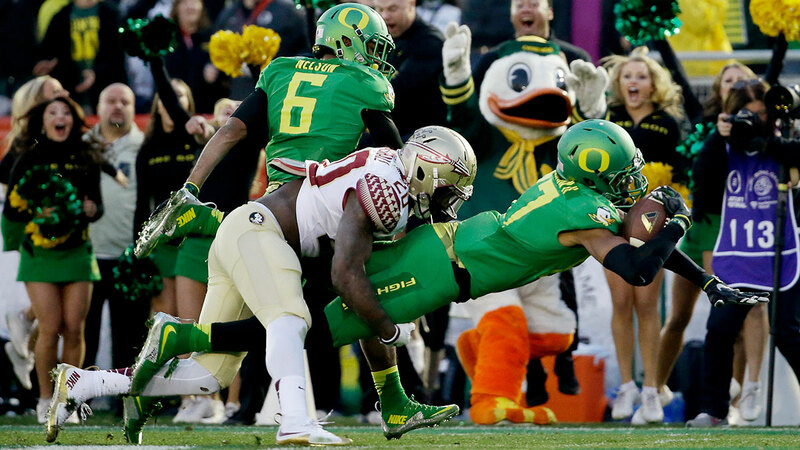 Oregon’s Rose Bowl–record 639 yards of offense is but a bend in the path to the title game. And a stopping-off point, we hasten to add, that the Ducks never would’ve reached but for the advent of the playoff. Remember that under the constraints of the BCS, Oregon wouldn’t currently be bound for Arlington at all. We’d have gotten Alabama versus Florida State, the top two teams in the AP and Coaches polls, and that would’ve been the end of it. Knowing what you know now, no matter your degree of playoff agnosticism, how ardently do you prefer this matchup over what proved to be a third-place game masquerading as a title-worthy matchup? Would the chirruping class still be calling Oregon soft, when after first winning a conference championship and then defeating the defending national champs the only thing demonstrably soft about this program is its mascot’s fluffy tail? Would we be preemptively missing having Marcus Mariota in the college game quite so feverishly, absent the sight of a 30-yard touchdown pass landing with barely a flutter directly into the hands of Carrington? There’s no zealot like a convert; in this year’s semifinal shakeouts, we have found our church. And that’s to say nothing of the Ducks’ second possession, in which, upon first glance, Oregon appeared to have scored three touchdowns in one drive. The two that didn’t show up on the scoreboard, flights of football fancy by Charles Nelson and Royce Freeman, will be crowded out by actual scores in highlight reels, and that’s a ducking shame; relive Nelson’s leap here.